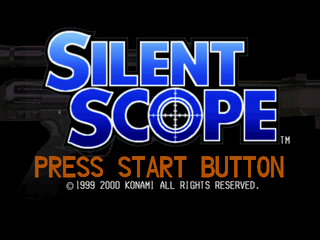 Silent Scope (サイレントスコープ) is an arcade shoot-'em-up game relased for the Sega Dreamcast. In Silent Scope, players control sniper rifle and have to take out bad guys. Despite the nature of play and the arcade cabinet utilising one, Silent Scope on the Dreamcast does not support any form of light gun, and so has to be played with a standard Dreamcast Controller. Game Main Programer: Hardboilder Shin. Main article: Silent Scope/Magazine articles.